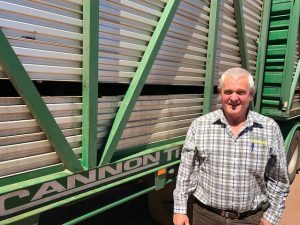 Peter Callanan of Shanahan’s Livestock Transport has been welcomed as a new member of the TruckSafe board of directors. An industry initiative, TruckSafe is a world-class business and risk management system aimed at improving the professionalism and safety of trucking operators nationwide and delivering competitive advantages to accredited operators. “Peter is passionate about transport and dedicated to ensuring best-practice animal welfare standards. I’m proud to welcome him as a new member of the TruckSafe board,” TruckSafe Chair Ferdie Kroon said today. The son of a livestock carrier, Mr Callanan has been passionate about transport industry from a young age. Keen to follow in his father’s footsteps, he completed a heavy vehicle apprenticeship and ran his own livestock carrying business in the Albury/Wodonga area for fifteen years. “Throughout his career Peter has also worked as a workplace trainer and assessor with Wodonga TAFE, a licence trainer and assessor for all classes of heavy vehicles, dangerous goods, load restraint and BFM accreditation, and has trained and delivered the Victorian Livestock Loading Scheme,” Mr Kroon said. Mr Callanan joined Shanahan’s Livestock Transport three years ago as Transport Manager and was responsible for creating company policies and procedures when becoming TruckSafe accredited. In his role as a TruckSafe director, Mr Callanan will join the board in delivering demonstrable benefits to road transport operators, customers, governments and the community, as well as helping customers to meet their duty of care and chain of responsibility obligations. “With years of experience and knowledge, I’m lucky to be in a position where I can now give back to the industry and help all transport operators,” Mr Callanan said.